Our video based Instructor led 3Ds Studio Max Training Courses takes you from the beginner level through the advance topics. Learn how to tackle any project and achieve the results you want in less time. After completing our course you will be able to manage complex data and scale your team to meet the needs of next-generation production pipelines. Learn to create your own professional animated 3D graphics for video games and other projects. Our course takes you through object modeling, material creation, animation, cameras, game characters, skeletons and rigging, scene generation, and much more. You will thoroughly understand the complete interface and be prepared to tackle any venture. Quickly model inorganic shapes with Pro Booleans. Place animation into separate layers to easily tweak dense and complex animations. View scene complexity statistics along with the resulting frame rate to measure and optimize scene performance. Feature enhancements in this powerful AutoDesk's software such as faster solving of complex cloth dynamics—deliver the speed and precision needed to meet time-sensitive production deadlines. Discover techniques for a professional design workflow, including how to organize your scenes and objects and 3D workspace. Easily share files, track work-in-progress assets, and customize production pipelines to accelerate creative workflows. Improvements to "XRefs" for better interaction with linked assets, support for relative paths, and Autodesk® Vault functionality help production teams optimize workflow and manage collaboration among members of a creative team. Produce stunning photo-real imagery. Use mental ray shaders to easily create beautiful skies with shadows from the sun or simulate metallic car paint. In addition, new presets for ambient occlusion, rounded corner effects, reflections, and refractions make it easier to achieve realistic, stunning results. 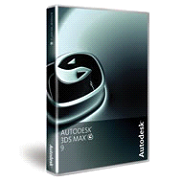 Harness the full power of the mental ray rendering engine within Autodesk 3Ds Max software. Learn about lighting a 3D scene in 3ds Max Desin and explore the application of various lighting techniques. Discover techniques for a professional design workflow, including how to organize your scenes and objects and 3D workspace.